The Washington State Department of Health has issued a warning about a mumps outbreak in several counties. State health officials are urging Washington residents to immunize themselves and take other precautions against the disease to stop it from spreading further. Incidents of the disease began popping up in October, and there are currently 278 confirmed cases in five counties. They include King County (160), Spokane County (80), Pierce County (34), Snohomish (3), and Yakima County (1). 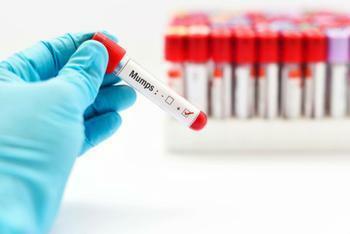 Mumps is a viral disease that can be passed from person to person. It usually starts with a fever that can last a few days, with symptoms including headache, muscle aches, tiredness, and loss of appetite. Swollen salivary glands are a trademark of the disease and can surface after the initial sickness period. Residents are being asked to be especially careful about close contact in order to reign in the disease. Officials say to avoid kissing, hugging, and other close contact with anyone who is suspected to have the mumps. If you suspect you have the mumps, you are urged to stay home and contact your healthcare provider, the local healthcare department, or the Family Health Hotline at 1-800-322-2588. Those who are healthy should consider receiving an MMR vaccine, which protects against measles, mumps, and rubella viruses. If you’re unsure if you've received the vaccine before, or know you haven’t, you can call your healthcare provider to schedule an immunization and blood test. To learn more about the mumps and receive more information, visit the Department of Health’s page here.